The first successful urban renewal was carried out on the Devil’s Acre slum in Westminster, England in 1889. Social reformers, philanthropists, and municipalities have discovered the amazing benefits of restructuring the urban characters of densely populated areas of the city as a tool to spur and accelerate growth. The rapid and ever-subjective industrialization around the world has forced many areas around cities to become cramped as vital services are shared by more people than originally planned. C & L Services is at the forefront of driving change to help people in urban areas live in healthy environments through professional street sweeping services. The company, founded on a mission to improve the quality of life within the municipalities it serves, has been at the forefront of driving supporting the environment for urban renewal projects. The rapid development of urban centers in New Jersey demands a company with a team of passionate conservationists with state-of-the-art equipment. This company will provide the sanitary needs of thousands of new residents and entrepreneurs that urban renewal projects attract each year. C & L Services provides more than just street sweeping but a comprehensive list of services to maintain municipalities and comply with stringent EPA requirements. C & L enjoyed accelerated growth by providing required services in these rejuvenated urban environments. C & L Services has also won awards for dedication to environmental conservation and the quality of services offered. It is no secret that C & L Services is a top choice for all the municipalities that they serve. C & L’s services are particularly invaluable in these times of urban improvement and rehabilitation – when old and run-down buildings are refurbished or replaced with modern buildings and housing. Emerging neighborhoods also find the seasoned street sweeping companies such as C & L up to the task of maintaining properties and cleanliness levels that strengthen the confidence that the people have in their living environment and municipal leaders. Considering that urban renewal in the US is often meant to persuade individuals to come live within the city and for companies and entrepreneurs to invest capital in previously neglected areas, C & L is proud to be a part of this renewal process. Our continued growth is a result of the long-term positive prospects for continuing urban renewal all over New Jersey. Even now as the cost of commuting rises and the cost of land higher than ever, the shift of people moving toward urban centers to cut costs and enjoy greater convenience has encouraged us to think of more creative ways to tackle renewal challenges. Urbanization is just over a century old, and with the way cities are flourishing with life, urban settlements will just keep getting denser and denser. Street sweeping services are going to enjoy continuous demand. Municipalities are making huge investments in renewal projects as well as in population support infrastructure and services including expansion of health services and amenities. C & L Services is properly equipped and prepared to improve the quality of lives of the people whose rejuvenated city settlements we clean. Have questions or comments? Call us at 732-886-1940 or leaves us a comment below. We’re serious about our commitment to urban renewal and how we support growth through street sweeping. Erecting a fence can serve several purposes. First, fencing is a great way to enhance privacy for tenants or people who live adjacent to the property. Many people put up fences primarily to keep critters and stray pets from getting into the property and to keep curious children away from “attractive hazards”. Whatever your reasons for wanting to put up a fence, one thing is clear: a properly erected fencing not only adds value to your property, it also improves the “curb appeal”. Whether you intend to put up a minimalist protective wire fence or a thick privacy fence, when you do it right, you will greatly improve the aesthetic value of the property. A nice fence adds decorative benefits such as improving the appearance of less attractive elements (such as dumpsters or utility meters) and the property in general. If some part of your property has a less-than-desirable appearance, fencing can not only hide that area but also keep it from becoming a collection point for storage. Before you hire someone to erect the fence, you should weigh your options as far as aesthetic vs purpose and decide on the right size and position of the fence. If the fence is properly placed and built with quality materials, it can have a very positive impact on the appearance of your property. For example, a six foot white PVC fence can keep unauthorized people away from the dumpster, and hide the unappealing aspects of the trash bin. Privacy aside, the utility is another concern that should shape your decision to install fencing on your property. If you’re using fencing to hide a trash area, you’ll need to allow room for the access door to swing or slide for the pickup service. You’ll also need to plan space for access to the trash bins or dumpsters for clean up or the possible increase in size for the future. There are many types of fences, usually presented beautifully in a catalog. Your decision on the type of fence you install should be based on the purpose of the fence, your budget, frequency of use, and the material you want to use. Wood is the most popular material but it usually requires the most maintenance. You could go with PVC or steel but these materials are more expensive. Concrete is the most durable but if your primary objective is to improve the aesthetic values of your property, it’s hard to beautify concrete without adding additional materials to hide the concrete. It is best to install a fence on your property to protect and beautify, but you can only achieve this with proper planning and expert installation. This is why we recommend that you consult a property maintenance professional prior to the project and hire a professional contractor for the installation. In the long run save you money, effort, and the disappointment that arises out of poor workmanship. We’ll be glad to talk with you, we’re property maintenance professionals with three generations of experience. Give us a call at 732-886-1940. We’ll be glad to talk with you and help you choose the right fencing. Beautiful neighborhoods, clean streets, and hygienic public spaces are only a part of the reason why street sweeping deserves respect. Most people do not realize it, but street sweepers do a lot more than just sweep dirt and debris; their work goes a long way to protect water resources, prevent floods, make roads passable by clearing the junk that blocks water drainages, and generally remove pollutants that could damage the health and well-being of the community. Click here to look at all the different types of stuff street sweepers pick up. While most people do not give much thought to street sweepers, they have been around for hundreds of years…almost as long as organized human settlements have existed. Street sweeping is now considered necessary for present-day waste disposal and has become a part of modern culture. Street sweepers stand out in the work they do because it is obvious when streets are not clean and the normal debris of modern life piles up. Street sweeping professionals are trusted to do their job well and are often expected to go the extra mile to work when the rest of the city is asleep. Since the street sweeping industry has embraced education, street sweeping has grown to become a profession with industry associations and professional certification. Your local street sweeper is a member of a group of professionals focused on improving the quality of work they do. Street sweeping is more of a calling than just a job. Advancement in technology has provided street sweepers with many benefits. Today, Professionals in this industry use cutting-edge technologies and equipment. Street sweepers apply their professional expertise to remove all types of dirt and debris as well as potentially harmful contaminants and pollutants. This is economically smart because it gets the job done right, fast and cost effectively. Our cities and neighborhoods would be unsightly—perhaps unhealthy were it not for the work street sweepers do. Their primary job is to sweep debris and litter and dispose of it in an environmentally friendly manner. The Environmental Protection Agency (EPA) has regulations and guidelines in place that guide street sweepers how to collect and dispose of all types of potentially harmful trash to protect the community. Perhaps the most noticeable benefit that street sweepers add to our world is improving and maintaining the value of real estate. The curb appeal of a clean street without litter improves the perceived value of the properties in the neighborhood. Whether it is a city, town, or neighborhood, proper street sweeping boosts the value of property. Street sweeping is a profession that provides stable jobs to tens of thousands of people across the nation. Most professionals in this industry specialize in a particular state or region and will often have roots to the community they serve. These professionals play an active role in contributing to the community both in and outside work. Making the city or a neighborhood clean and habitable is everyone’s responsibility, but street sweepers make the most visible contribution to ensure this happens. The next time you see a clean street, remember someone dedicated time and effort to make it that way. Looking for a trusted street sweeping partner? Please give us a call at 732-886-1940. We’ll be glad to give you a quote and share out passion for street sweeping. Potholes and cracks appearing on asphalt coated surfaces are bound to appear with time, and they are almost always caused by long, sustained damage and temperature variations. Good property maintenance demands that such a surface—be it a pavement or a parking lot—be repaired as soon as the damage appears to prevent further damage and mitigate the costs of the asphalt repair. If you’re looking for an experienced paver, read our article, Paving: How To Find The Right Paver For Your Project. Sometimes, depending on the severity of the damage, repair may involve simple patchwork or it may take a lot of work to restore the surface. There are different ways to do the repair, the most popular being cold patch and hot mix. Read on to discover the difference between the two. Some people see this as a “do-it-yourself” asphalt repair technique because of its simplicity, cold patch repair is a method that involves the use of ready-made polymer-modified asphalt. The asphalt is mixed with water then poured over the pothole or crack to fill and packing it as best as possible. The mix will dry quickly and the repaired surface will typically be ready to use within three to five hours. As you can imagine, cold patch asphalt repair is a temporary fix that is great for small repairs that have to be carried out fast but do not necessarily have to be permanent. It is a very economical approach to sealing small potholes and cracks compared to hot mix patching and does not generally have a long life expectancy. Experts recommend that an asphalt surface is cold-patched as a way to mitigate further damage until hot mix patching is available or affordable. For hot-mix asphalt patching, a solution made up of sand, gravel, or stone and asphalt cement is heated up to over 400 degrees and transported to the repair site. This mix is poured into the cracks and potholes on the surface and heavy rollers are used to smooth the surface. This technique of asphalt repair is not for do-it-yourselfers considering the equipment and effort required to make the mix and apply the patch the right way. If you have a surface with deep and wide potholes or large areas of damaged pavement, hot asphalt patching is the ideal solution to restore the surface with permanent results. While this process is more expensive compared to cold patching, it leaves the repaired surface as attractive as new. 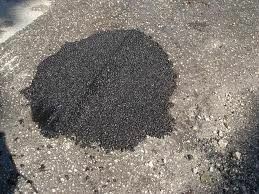 Hot asphalt patching repair requires more thorough preparation, and the surface takes more time to be ready for use. The extra time is needed so the mix will harden properly and bond with the asphalt surrounding it. The best choice for repairing damage on an asphalt surface is hot mix. Not only does it produce better and lasting results, over time it is cost-efficient and a great way to preserve the value of a property. Cold patching, on the other hand, is a good temporary fix that can be used until hot mix patching is available (or affordable). Do you have more questions on which type of asphalt repair you need? 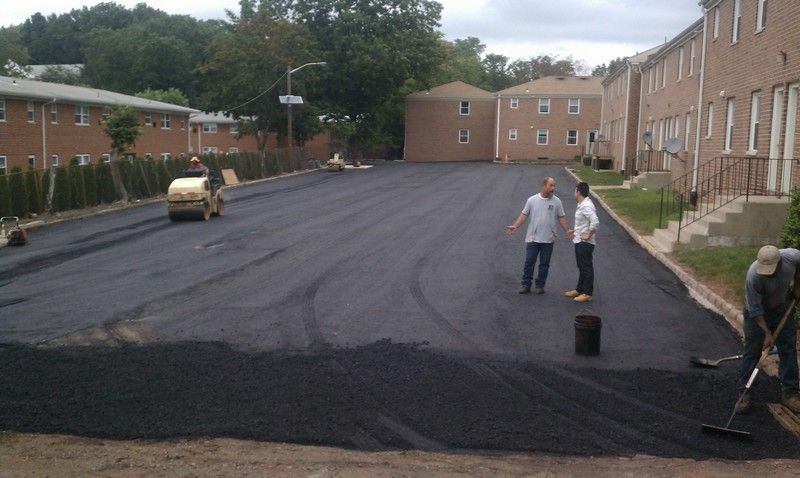 Call us at 732-886-1940 and we will be glad to discuss your asphalt repair needs, objectives, and budget.